Goback to your childhood, well, my childhood and check out the great cartoon Astro Boy! Created by the “Father of Manga” Osamu Tezuka. 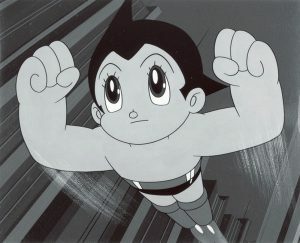 Astro boy appeared in comic form in 1952, he was called Mighty Atom in Japan. The animated series was started in 1963. He’s like a modern super powered Pinocchio. So check him out!